It may be that I just look in all the right places, but Vox helmets seem to be on sale all the time. They are perpetually discounted, so even if you think you're buying a $300 helmet, you end up spending $100. This makes me wonder why they don't just lower the price instead of continuous sales, but it means you can poke around and find a pretty good price. The unexpectedly inexpensive Vox modular has some features that make a helmet as easy to wear as it is smart to wear. 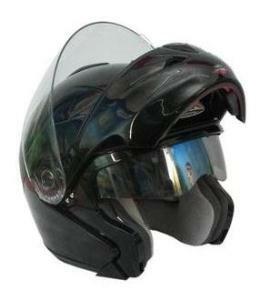 The flip-up chin and face shield let you get some cool air, a drink of water, or have a conversation without having to remove your helmet. All modulars have the roadside convenience of an open helmet and the protection of a full face helmet, but they don't all have the sun shade. My current helmet doesn't have one of these, but my next one will: a built in tinted-visor that you can flip down when the sun comes up. No more switching visors or stopping to unpack your sunglasses. More features are packed into the Vox, such as adjustable vents, a UV protective optically-correct visor, and dual density lining. The shell is constructed of ABS and has an ABS and polycarbonate alloy chin bar. This is not the most advanced helmet on the market but, in truth, most of those are more than you need. The fit is just weird, so find a friend who has one and figure out what size you really need. I suppose these little quirks may explain all those sale prices.